Fan Made Ultimate Slug by Doktor Frogg Minion is now a coloring page! Ursula swims her way into the 2014 Halloween Cubeecraft Collection with her evil smile and creepy demeanor. She has a sinister evil and plots her revenge with her desire to rule the oceans and perhaps the world. 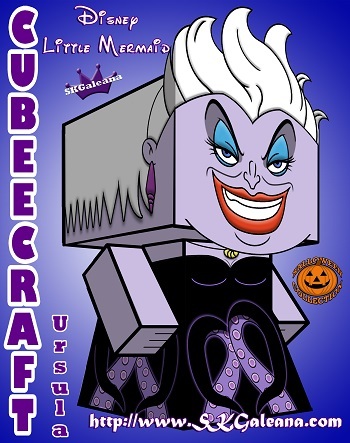 This cubeecraft features the Ursula the evil Sea Witch from Disney’s A Little Mermaid. She comes complete with eight tentacles and her wavy white hair. Part 2 is the body. 5. Fold along the base lines of the body. Slide each tab into the slots created with an x-acto knife. Use the image above for an example of how she should look when completed. This cubeecraft is free to download print and create. If you share this cubeecraft, please give credit to SKGaleana. Click the images below to save them to your computer.